"Millions are in uproar in #Cairo. Rumor is they heard our new spring collection is now available online at [LINK] -KC"
Kenneth Cole tweeted an apology when a Twitter uproar ensued that blasted Kenneth Cole for its shameless self-promotion on the back of human suffering. Once again, perfunctory apology tweeted. ﻿1. Learn what Twitter hashtags are being used during a crisis. Typically during a crisis, several hashtags appear, allowing the crisis to be followed with a high degree of precision, based on hashtags that identify given aspects of the crisis. Understand what the hashtag means. If you're trying to find out what a Twitter hashtag means, there is a site you can visit for some help: What the hashtag? 2. Never use a crisis hashtag for anything other than important information related to the crisis. 3. Keep advertising out of Twitter crisis hashtag streams. I am guilty of retweeting the bing one, thinkng that it was more benevolent that it was. Another reminder not to check common sense at the door during a crisis. Don't be hard on yourself Kitlat - you were trying to do a decent thing. Bing - was not. I agree: Intentional hijacking of a crisis hashtag to promote your company is wrong. I also agree that no one should use a crisis hashtag that people might be using to search for loved ones or coordinate on-the-ground response. By using "#SupportJapan," Bing is in the clear on the latter point, at least. When I saw the Bing tweet yesterday, my first thought was, "Is this legit?" I initially clicked thinking I'd be debunking a twitter version of the old email hoax. But the link was legit and provided several good resources for people that might be wanting to #SupportJapan in a concrete way. So I RTd it, twice. Happily. It seemed a much better use of the hashtag that just tweeting, "Oh, the humanity! #SupportJapan!" "Do you want to '#SupportJapan' in a real way, not just by tweeting this hashtag? Here's a link to a list of real-world ways you can help. And to encourage this message to spread, we'll donate another dollar every time it gets retweeted so that more people can see these ways to donate. [Subject to a stupidly low $100,000 because my old fogey bosses are freaked out that if we don't cap this it could get RTd 97M times.]" The (relatively) small size of the donation speaks to their "innocence" in this situation. Bing is a big boy. If they were going to play in the Capitalizing On A Tragedy For Company PR ballpark, they would have played bigger. 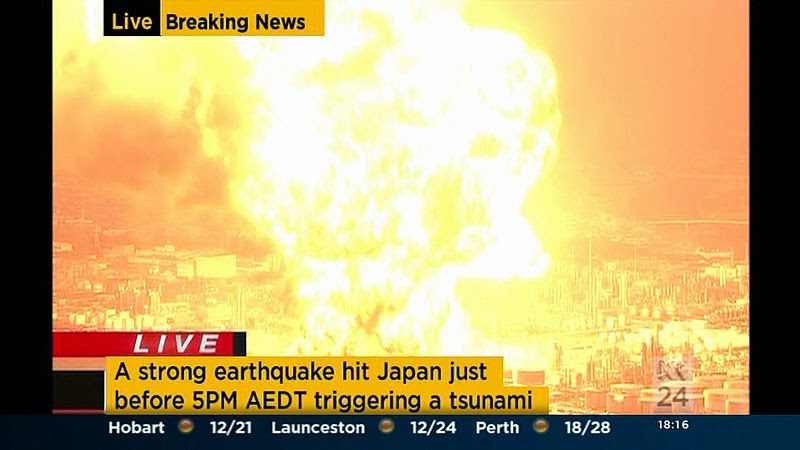 Giving a donation big enough to be news in itself would draw independent PR attention to their donation, and in that case, tying the donation to the tweet would be in hopes that the story would read, "...and they did it all while encouraging people to support Japan! What heart!" In retrospect, sure, there are things they could have done better. But "shameless, despicable..."? I don't see it. Are you serious? You attempt to draw some kind of equivalence between KCole's tweet and Bing's? Did you even click the link Bing was trying to get retweeted as much as possible? It's a list of ways to help, plus an honestly interesting discussion of using Bing Maps for disaster mapping. Glen, I think you're flat wrong here. To be even close to similar, Bing would have had to be cracking a joke, or maybe overtly saying something like "Bing is better than Google...see why." If you throw water on the concept of a company donating $100,000 to charity by retweeting a link that has the potential to donate thousands more, then Twitter's capacity for good will be seriously limited. I don't want us putting restrictions on how companies can use retweets, while getting a small amount of recognition for spreading the word on how people can help. Sorry guys, but I don't buy that Bing simply made an error of execution in attempting to do a good deed. As to their link to helpful sites, they made no reference to them in their tweet. Perhaps after @KennethCole's escapade, I'm being too harsh....I don't think so. Thanks though for sharing your thoughts! Good article, wise also to "search" the word you want to use before adding a #. Example: for recent Fire incident http://twitpic.com/44pw0t . Would add you can always suggest a hashtag but the public may not us it so best to be flexible and adaptable Example: Boulder Fire; the (City) Police scanner feed was #BOCOfire A citizen Tweet read #Boulderfire CBS was using #cbsfourmile as the Fire spread so did the hashtag change #LovelandFire and others were used but #BoulderFire was the predominate one used. #BOCOfire from the onset was rejected. Love the observation that while "you can always suggest a hashtag but the public may not use it so best to be flexible and adaptable." This is an important for emergency responders: flexibility and adaptability are key in communicating effectively in a crisis, especially, in social media. Thanks for the recommendation -- I'll be passing it on! I'm not sure why your objectivity meter is off, Glen. It's really hard to defend that you drew any equivalence between the KC brand tweet and the Bing tweet intended to help Japan in 2 ways. Was Amazon wrong for tweeting a way to donate to Japan specifically via Amazon Payments? Maybe some people weren't aware of Amazon Payments before they offered the specific link, and I'm glad I'm aware now. It's KC/Bing being mentioned as even remotely similar that's still upsetting me. Glen G: "Once again, perfunctory apology tweeted." The above is all Glen mentioned about Bing's apology. 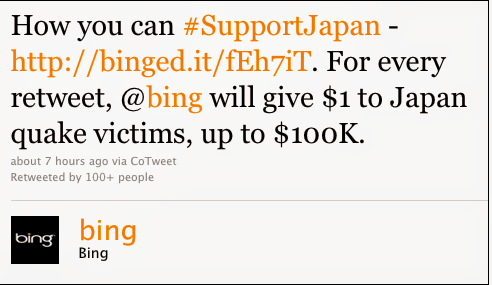 In fact, Bing quickly apologized AND donated $100K immediately. jayinatlanta, While I appreciate the fact that Bing anted up with the $100,000 cap it had set for the maximum amount it would give if it had hit 100,000 retweets of its original message, that doesn't move me over to Bing's column. $100,000 coughed up by a player like Bing after it saw its PR ploy veer off course? That's chump change for them. Sorry. The Bing example clearly nowhere in the ballpark of the KC example. Hmm, where do you want to draw the line? Thanks Tosk. All fair remarks and questions. I still choose to stand my ground. Very interesting discussion. Many eyes see many things. There are many good points being made on both sides, but I only want to comment on one. I agree fully with Glen's point that emergency and crisis hashtags, which are created for the purpose of updates, finding people, responding to calls for help, and calling for help, should be kept free of any marketing or self-promotion. We can promote, and are free to promote, our special offers, or donations per retweet, to our own twitter followers to retweet and don't need to gum up emergency hashtag communication lines to do that. This has been a very useful discussion to read. It has certainly caused me to think about the subject, and helped me to decide what I think on the topic. Thank you Glen for raising this topic. I'm glad you did, as I haven't given it much thought till now. All the contributors made some very worthwhile points, and I appreciated reading all the input. Great read people. Very intelligent and civilised group. I am glad to see that my post has sparked some debate, even though some of it has been directed at me. All of the comments strike me as being fair and thoughtful, and have helped me to better wrestle with the issues raised. Social media is evolving and so are the rules. Bing's approach obviously struck me the wrong way, though I certainly don't want to discourage honest initiatives that bring much needed help. I also should note that although I think Bing's approach was wrong, they did not use a hashtag that interfered with emergency communication: it was an appropriate hashtag. Tracking the crisis and watching the bevy of hashtags appearing for distinct aspects of the Japan crisis, it seemed a fitting moment to alert folks to the fact that in a crisis distinct hashtags are created with the aim of becoming focused communication channels and that even the best intentioned should take care not to flood such channels with unrelated messages. Sadly, it seems this crisis will be with us all for some time and may even get worse. Helping folks understand better how Twitter is used in emergency communications should help make those communications even more effective. I know that I could have raised those points without blasting Bing, yet, my impression of what they were doing is part of what inspired me to write this blog in the first place. Thanks again for sharing your thoughts - and my post. Hashtags are always optional, but in a crisis they become extremely important as they're used as emergency beacons. This is why I thought I should raise a caution flag. There are, in fact, hashtags that are universal, but others that are distinct to a given language. This is especially true in the current crisis in Japan. As we all work to make Twitter a more effective platform, understanding these nuances will help us all have a better experience -- and, at the same time, make Twitter a more effective tool in time of crisis. Samsung's "we'll give a $1 to Japan relief for every RT of our tweet up to $5K ($5K from a company the size of Samsung?!)" on the heels of Bing's debacle suggests they weren't monitoring social media or they're just risk takers. At the end of the day, we're going to want corporate giving, even if it comes with an RT request. Corporations should, however, consider that sensitivity to timing and message does matter. We're all working through the rules. Some of those rules should be readily apparent in matters of decency and human suffering - and the crucible of social media is pretty good at telling us what's authentic and what's not.